This afternoon company 11 was alerted as part of the 2nd Alarm assignment for a structure fire on the outskirts of Boonsboro. Units from Boonsboro arrived to find heavy fire showing from a large barn with exposure issues to other buildings and a single family home. A Tanker Task Force was started do to no localized water supply (Fire hydrants) and a Second Alarm was also started do to the number of structures in danger. Crews were able to keep the fire from extending to the other structure’s and worked from late afternoon into the late hours of Sunday night. Thankfully there were no injuries during the fire (Civilian or Fire/Rescue), only minor damage occured to the House and other near by structures. The fire is currently under investigation. While Engine 11-2 and Engine-Tanker 11 operated on the scene of this fire, Loudoun County Va Engine 626 filled in at station 11 and handled an Auto Fire on Rt 340 at the Potomac River Bridge. Thank you to the crew from E626 for filling in at station 11 and covering the “Valley” for us. 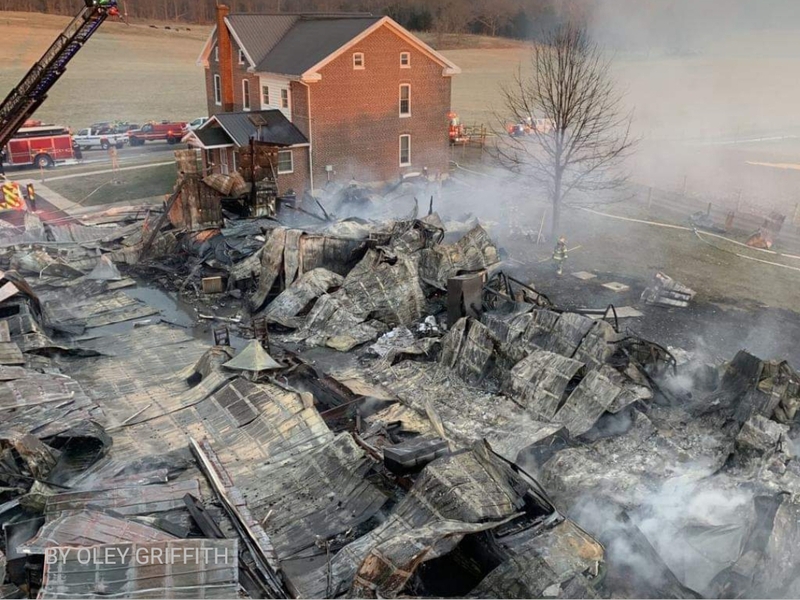 *Fire scene photo was taken by Chief Oley Griffith of the First Hose Company of Boonsboro.